The control of the world's water resource is arguably one of the most important issues. Water demand from industry and domestic users is set to rise throughout the industrialized world, while water supplies are finite. Legislation is constantly demanding improvements in the quality of potable water and reducing the levels of contaminates that may be discharged. Over the last 10 years, Yokogawa has been applying minimized maintenance measurement systems into an industry that more than ever today is concerned with conditioned based maintenance and integrity of the measured variable. Enclosed within are details of some of the practical solutions applied by Yokogawa that have helped our clients achieve their objectives of making quality measurements in often arduous conditions. A pH system that monitors it's performance on line and will provide a warning of impending failure, before that failure actually occurs, sounds more like fantasy than fact. If we were to add that it also keeps itself clean automatically and on line, you could be forgiven for believing it's too good to be true. The system we speak of exists and has been proven to perform within the water supply and treatment industries on real applications over many years. Yokogawa's EXA pH analyzer incorporates sophisticated diagnostics that monitor sensor and cable condition every 2 minutes, 24 hours a day. The compact series of holders for dip, insertion or flow through installation incorporate a spray cleaning system that has proven itself able to keep the electrodes clean in the most arduous of fouling applications. So how does this highly effective labor and cost saving system function. The sensor diagnostics works by measuring the impedance of the reference and glass electrodes by way of the metal liquid ground pin. This resistance measurement can detect glass breakage, reference coating, blockage or washing out,cable short or open circuit and loss of sample. Without this diagnostic system the response of any pH system under failure conditions is uncertain. The pH reading may drive high or low, or it could just drift randomly. A broken pH glass will most likely result in a reading of around pH 7, and as the majority of applications are for neutralization this is obviously a 'fail to danger' condition. 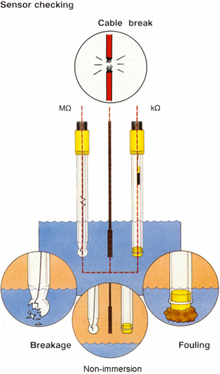 On line sensor cleaning using a chemical spray controlled by the transmitter, is a proven method of automatically maintaining clean electrodes. Keeping electrodes clean is a pre-requisite for good performance as a dirty or coated electrode will at best be slow to respond and at worst will not work at all. The EXA transmitter takes on line washing one step further with the patented on line dynamic recovery test. This uses the change in pH value and the time to recover following the wash,to calculate the response time. This dynamic test provides an excellent indication of sensor condition because the first sign of an aging or coated sensor is prolonged response. When the instrument detects a slow response, the sensor is still functioning and providing a valid signal. This is most important because a warning of impending failure before any failure occurs is extremely useful in reducing the incidence of emergency callout to failed systems and maintaining signal availability. Another maintenance saving feature is the transmitters ability to cope with changing measurement conditions. For example if the coating nature of the water increases for any reason (e.g. oil in waste water), then the impedance diagnostic can be used to internally trigger the wash system independent of the normal timing. This means that transient effects are compensated within the instrument without generating any external alarms thereby saving unnecessary call outs. When you combine the on line diagnostics with the off line monitoring of slope and asymmetry potential performed during routine calibration, this instrument and sensor combination will always be monitoring it's own performance providing a local error indication and volt free contact output should it stop measuring FOR ANY REASON! These two pictures show identical sensors installed on the same application for the same time duration. One sensor has on line cleaning applied and is in excellent condition with many years life still remaining. The other has not been cleaned, it has a high reference resistance, slow response and will soon be unserviceable. The EXA DO402 dissolved oxygen analyzer system is specifically designed for applications in waste water treatment plants, offering the reliability and accuracy required by today's water treatment processes. Broad range ability makes the DO402 suitable for both aerobic and anaerobic processes. Accuracy is maintained by fully automatic compensation of temperature, pressure and salinity. Compensated values are displayed in ppm, mg/l or as percent saturation. 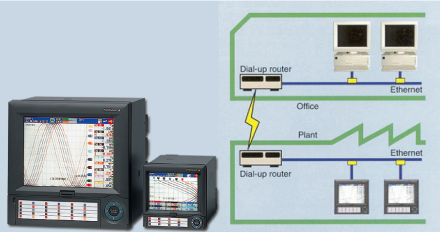 Two analogue, four relay and digital outputs are available, communicating measured values, alarm, control, wash and fail outputs as well as full remote set up/interrogation via RS482 communications. Simple yes/no dialogues guide operators through the programming and routine maintenance of the analyzer system. Sensor diagnostics are constantly monitoring for any breakage of the membrane and during calibration, sensor performance is evaluated and logged. The process of building in reliability continues with the simple galvanic sensor and the PB350G/360G floating ball holder. The PB350G/360G provides consistent insertion depth without any raised edges or hollows to collect deposits and encourage fouling. A brass shroud surrounds the sensor, adding the natural ability of copper to prevent unwanted growths forming on the membrane. Whether the application is in river water or activated sludge, the DO402 oxygen analyzer system reduces maintenance saving both time and money. The requirement for calibration of instruments is the one of the largest drains on resources, especially in industries where one company operates many sites, spread over a wide area. Pressure transmitters, being among the most common device on many process plants are no exception. Most suffer from significant long-term drift as a result of the instability of the sensor. The DPharp series from Yokogawa uses a unique sensor technology utilizing semiconductor technology. DPharp has brought unprecedented performance to the process industries. Its long term stability in service, as seen in the chart below, means that it does not require calibration over many years. This long-term stability means that we are able to offer DPharp transmitters with an UNCONDITIONAL guarantee that they will not need calibrating in 5 years (10 years for EJX) of service. DPharp transmitter provides significant cost savings, specifically in reduced maintenance expenditure. Available in sizes up to DN400, the Admag AXF range of Electromagnetic flow meters incorporates a high integrity meter tube with reinforced liner and unique leakproof electrode construction. A perforated bridge plate retains the Teflon™ (PFA) liner, providing unparalleled resistance to pressure, vacuum and wear, making it ideally suited to sewage sludge applications. The unique electrode design provides extremely high sealing efficiency under all process conditions, and hence is totally leakproof. In addition, the flush internal profile of the electrode in the tube liner means greatly reduced impact from solids, resulting in less noise and wear. 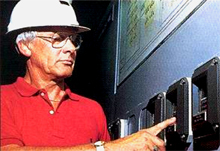 The result is more accurate monitoring, longer life in service and reduced maintenance. The RAMC variable area flow meter by Rota-Yokogawa is perfect for low cost flowrate indication of Oxygen in water treatment applications. Its cold-forged curved tube contains a tough float, damped to protect from stem damage. 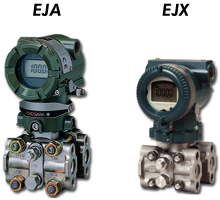 The indicator provides a large linear scale and digital indication of flow rate and total flow. The model is also available with a unique float blockage detection system as a part of its advanced diagnostics. RAMC is the perfect solution where cost-effective gas flow monitoring is required and offers accurate, low maintenance measurement in line sizes DN15 to DN100. The digester gas (Biogas) generated during the biological process is often used as a source of fuel due to the high methane content of the gas. Measurement of the digester gas can be problematic due to the 'dirty' nature of the gas and pressure loss limitations of typically 30mbar maximum. The Yewflo vortex shedding flowmeter can be applied successfully in these applications due to its inherently low pressure losses and high measurement accuracy, coupled with the fact it has no moving parts. Available in line sizes from DN15 to DN400. Collecting data from unmanned stations can be time consuming and expensive. By connecting Yokogawa's DX paperless recorders remotely to your office, data can be retrieved without leaving the office and without pressing a single key on your computer. The File Transfer Protocol (FTP) client function periodically and automatically transfers files from the DX paperless recorder (FTP Client) to a server. Dual servers can be utilized, such that if one fails or is unavailable, then the files will be transferred to the secondary server. Since permanent telephone connection is not required, the recorders only connect to the server during file transfer. The system is highly secure because the files are being sent to the server and are being stored locally in the paperless recorder on high-density storage media. This media can be accessed from the server as well, allowing for additional protection of critical data. If an immediate indication of plant condition is required, then a 'snapshot' of the screen of the DX recorder can be sent over the network giving the user an instantaneous appreciation of plant signal trends etc. The DX series of paperless recorders can offer a cost effective and secure solution utilizing modern networking technologies. We have now reached the stage where the 'window' to the process is accessible with conventional office technology. Yokogawa's Customer Service Division offers technical assistance ranging from telephone assistance, on site service to all-inclusive maintenance contracts. Additionally our Runcorn facility is equipped for the testing and repair of returned equipment. Training at all levels can be provided either at your site or at our facility in Runcorn.